I had the idea to paint this parking lot blue. 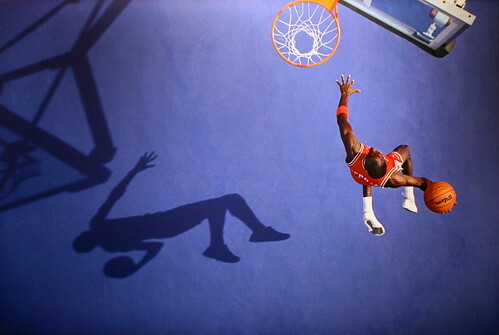 I also trucked in an NBA-regulation basket that I could move to create a shadow where I wanted one. I stood in a cherry picker, some 20 or 30 feet above the ground, and looked straight down, waiting for the right light with a camera that took 14 frames a second. Michael has young legs back then and could fly. Not only do you see his beautiful form from above, but you also see the same image from the side, in his shadow. Of all the pictures I've taken of him, it's my favorite. It was just so unusual; no one had quite gone there before.